Come along and join me for an exhibition of works by painter Doreen Fletcher. Doreen Fletcher’s atmospheric urban landscapes have only recently captured an audience, when the discovery of her paintings revealed a distinctive vision of the changing capital. For the first time, the Protected content will bring the majority of her work back under one roof, in the home of their making – the East End. 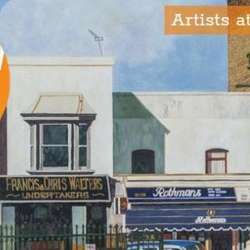 For twenty years Doreen Fletcher painted the streets of east London until discouraged by lack of recognition, she gave up in Protected content . Only a chance meeting with The Gentle Author of Spitalfields Life brought her painting to public attention in Protected content . For the first time, this retrospective reveals the full breadth of Doreen Fletcher’s achievement between Protected content 2004, showing the largest selection of her paintings together, and including many previously unseen pictures from private collections. Doreen Fletcher’s retrospective at the Protected content coincides with the publication of a monograph of her work by Spitalfields Life Books (published November Protected content . PLEASE ONLY JOIN THE ACTIVITY IF YOU WILL BE PRESENT OUTSIDE THE GALLERY AT 3PM ON SATURDAY 2ND MARCH.